Frogs is an attempt to recreate the horror of Alfred Hitchcock’s The Birds. Frogs mostly falls flat, however. Frogs isn’t a bad movie, but it doesn’t succeed at its’ premise, either. It’s a story of the environment gone wild, with wildlife attacking people. People are killed in a variety of ways by snakes, tarantulas, Spanish moss, etc. — but not by the titular frogs. 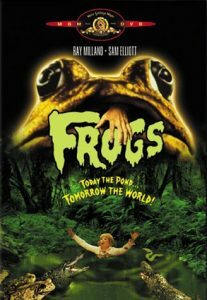 The frogs of the movie are present all over, hopping and croaking, but not being very menacing. Even in the final scene, when they cause a death, they don’t actually do anything. Jason Crockett (Ray Milland, The Lost Weekend). The family patriarch who has gathered his family for the annual joint Independence Day and birthday celebration. A man used to not being questioned, very wealthy – and stubborn to the point of stupidity. Michael Martindale (David Gilliam, Slumdog Millionaire). Sent out to repair the damaged phone line, and quickly murdered by tarantulas and Spanish moss. Iris Martindale (Hollis Irving, The Facts of Life). Jason’s sister, who loves to collect butterflies and is killed by leeches and a rattlesnake. Kenneth (Nicholas Cortland, Search for Tomorrow). Iris’ son, sent into the greenhouse to collect flowers, killed by dozens of lizards that knock over jars of poisonous chemicals – killing him. Stuart Martingale (George Skaff, Man Beast). Iris’ husband goes looking for her, but falls into the swamp and is eaten by alligators. Clint Crockett (Adam Roarke, El Dorado). Who swamped the canoe, and later takes the maid, butler, and Kenneth’s fiancee across the lake, swims to reach his boat, gets killed by a water moccasin. Jenny Crockett (Lynn Borden, Hazel). Clint’s wife who tries to rescue him but gets stuck in the lake mud and is killed by a large snapping turtle. So, in Frogs, there are a lot of murders by vengeful swamp creatures – but none of them are frogs. Most of the cast dies, except for the few who haven’t been using pesticides, etc. It’s a little heavy-handed, but the acting itself is very good. The various deaths are somewhere between contrived and silly, however. Millionaire Jason Crockett (Ray Milland. No, really. Ray Milland) hates frogs. Naturally, he lives on an island estate in the middle of a big Southern swamp. His family also hates frogs, so much so that they clap their hands over their ears and scream about the horrible, horrible noise. Everybody joins in spraying toxic chemicals around, little realizing that these frogs are not just moist, they’re mad. Hopping mad. The family gathers for Grandpa’s annual birthday celebration, unaware that doom is hopping toward them on wet, flapping feet. The point is driven home with shot after shot of the frogs hopping… hopping… hopping… and occasionally being tossed by a helpful stagehand. Actually, the whole swamp is mad–snakes, snapping turtles, and even crocodiles- -which is really for the best because the only thing the frogs seem to have in the way of menace is that hopping thing.